The winter is here again, which means it’s time to hit the slopes for another exciting ski season at Gore Mountain, nestled in the heart of the Adirondacks. The 2018 season promises to bring winter sports fans everything they love about Gore year in, year out, along with many new improvements and expansions intended to offer visitors an even better experience. New Saddle Lodge: The old mid-mountain lodge has been totally renovated to a much larger modern space. Between runs, warm up and grab a bite to eat in front of a spectacular view of the Adirondack High Peaks. The updated kitchen features an expanded menu and a new smoker serving up pulled-meat tacos and ribs! Warm-Up Spot: There is a new warming lodge at the Summit called the Straight Brook Lodge. This is a fabulous repurposing of the old gondola unloading station. 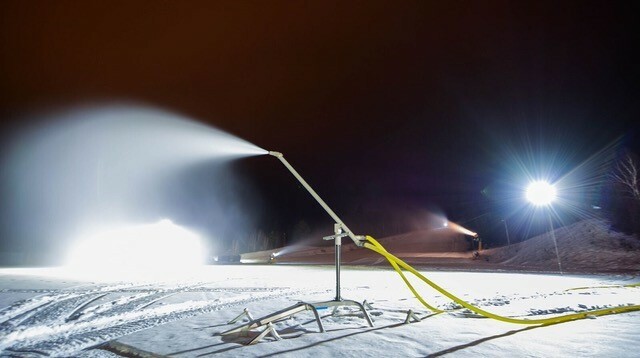 Lots More Snowmaking: Gore added 136 new snowmaking guns with updated technology to the fleet this season, making it faster and more energy efficient to lay down the corduroy! Green Skiing: We are very proud of Gore Mountain’s environmental advances. Gore has a 25-year solar energy contract that offsets 85% of the mountain’s energy needs, and it has been recognized with the esteemed Golden Eagle Award for Overall Environmental Excellence. These awards are overseen in a partnership between Ski Magazine and the National Ski Areas Association, and are the industry’s most prestigious honor for recognizing resort environmental programs and projects. Several other environmental initiatives contributing to Gore’s achievement include increased service of locally produced foods, strategic trail modifications that conserve energy and redevelopment of the historic North Creek Ski Bowl with “recycled” trails and earthen freestyle features. Park ‘n’ Ski: There is now more Gore Parking and enhanced shuttle service to get you on the hill quickly after parking your car. (And while you’re there, look for the new electric car parking spaces with charging stations.) Better yet: Leave your car at the Alpine Lodge and avoid the hassle of parking altogether! The shuttle will pick you up at our front door. Upgrades Galore: This season, nine of the 11 trails at Gore Mountain’s Nordic network at the North Creek Ski Bowl now have snowmaking. The beginner experience has also been improved with trail modifications. Something for Everyone: Gore Mountain offers seven freestyle areas and 27 different glades for off-piste back-country excitement. Gore has always been known for its wide range of varied ski terrain; even from the top. Whether you are a beginner “snowplow,” an easy-going “stem christie,” or an advanced “double diamond” type, Gore has a lot for you! ***Are you looking for the ideal base camp for your next Gore Mountain skiing excursion? Look no further than the Alpine Lodge. Consider one of our Ski & Stay packages for an unforgettable winter adventure. Please call us at (518) 251-2451 if you need any help with your reservation. Sign up for deals, promos, and news! Did You Check Out Our Packages Yet? We have packages for everyone from Ski and Stay Packages with tickets to Gore Mountain, Romance Packages to rekindle the romance with a special someone, to Elopement Packages. View our packages page for more information and details.